Plan your summer weekends and vacations now. There's a bike path from Ottawa to Rigaud? Not much of a route from Rigaud to Montreal though. That bike route south through Vermont looks good... very good! The biggest problem with google maps for bikes is that it is so incomplete. There is a bike path from Anderson Road in Ottawa to St. Eugene, which is just before the Ontario/Quebec border. But it doesn't go into Quebec. It's on an old rail line. Close to 100 km I believe. 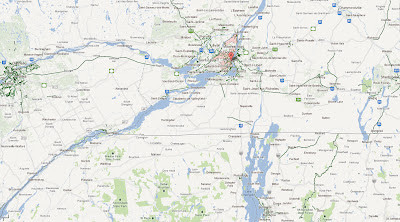 I'm interested in biking to Montreal and still trying to figure out how to get from St. Eugene to downtown.